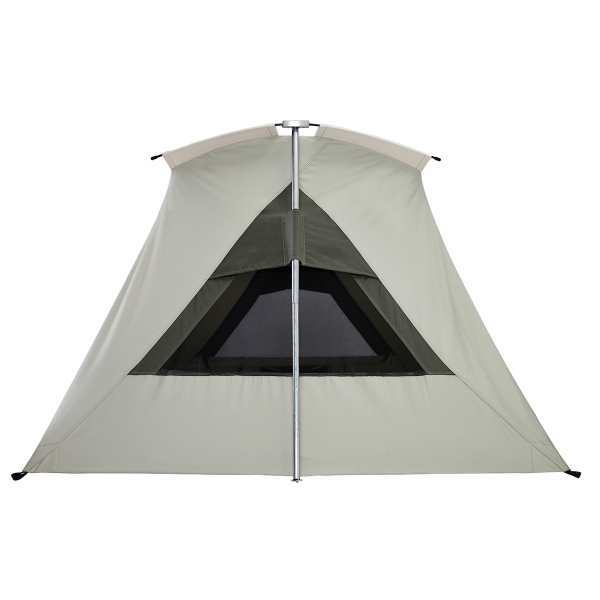 Estimated shipping date for this tent is 4/30/2019 due to high demand. Floor size: 8.5 ft x 6 ft. I mostly camp solo and take the 10x10 out when it's cold enough to need a heater. For warmer weather and a lot easier setup, the two-person is great. I still won't camp in a typical Maryland Summer swelter, but with a Byer Allagash cot to get me a few inches off the ground and my camping season has been extended into warmer weather than I could handle in a nylon tent. Canvas insulates! Typical Kodiak contruction - durable and seriously weather resistant. Love it! I bought this tent for scout camp. I love it. It is sturdy and stands up to big wind and rain. I have an 8 man tent just like it and it is wonderful too. I bought from Competitive Edge and they are amazing in customer service. Goes up quickly. High quality construction. I like having a window in each wall to catch any breeze. I received confirmation that the tent was being sent to me on the 4th of November and that it would be at my house on the 9th. I was surprised when FedEx rolled up on the 7th around 5 pm with my tent. Excellent shipping time! I own a 10 x 14 and love it for several day's to a week camping trips with my family and hunting. It's a great tent too! When I got the tent it took about 15 minutes to stake it out and set it up and I love it. I seasoned it and it was water tight. Left it up due to rain coming in for the next two days and will check on it! I can't wait to take it out on a couple of nights that I go out hunting on the weekends and see how it does! Two thumbs up to Competitive Edge for the service and excellent product!!! I haven't gone camping in this tent yet but I did set it up in the yard. 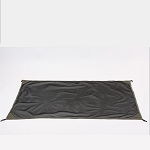 The tent looks very durable and should last a lifetime. Can you use a portable wood stove with this canvas tent? Just received my Kodiak flex bow tent. Did the yard setup and water hose down. I have lots of experience with the standard back packing tents but zero with the flex bow design. Question is would a tie down line to each of the support poles be worthwhile or would it interfere with the original design theory? Quality built, very good construction and materials. I've got a small spring bar tent that I love, but I can tell you this is a better tent. Fast fast shipping. Q: Is the two person flex bow tent large enough for a low height cot? A: yes. It's 4' tall so just keep that in mind. You may want to measure against your cot height. Q: I'm an older woman with diminished strength. In the video it looks like connecting the T-posts might take a lot of strength. What do you think? Q: I just took delivery of this tent. I am impressed with the tent and quality. Looking forward to lots of good camping. Set it up in the yard and gave it a good soaking. The tent was good and tight fitting. But, the soaking left a pool of water in the top about the size of a dinner plate and an inch or so deep. Question. Have any of you experienced owners of this tent had this pooling? If so have you come up with a easy fix? Maybe some sort of a tie of the roof fabric to the cross bar. Appreciate feedback. Q: I have this tent on order. Should I seam seal the bottom seams from tent to floor IE does the tent leak at this seam line when water pools up? Q: What are the dimensions when packed up? Q: I already have the Kodiak truck tent. I am looking for an add on 'room'. After a mattress goes into the pickup bed not much room left over... will this or another tent 'attach' to truck tent? A: We don't have any way to expand the truck tent, but you are welcome to order another tent so that you have 2 tents. The 6086 two-man tent is a great option and doesn't take up much room. Q: I'm 5'8" , can I stand up in this tent? A: I'm 5'10" and I can stand up in the tent just fine. Feel free to contact us with any other questions. Was this answer helpful? 2 of 13 Customer(s) found this Answer helpful. A: If you're talking about the 2-person tent, then no. 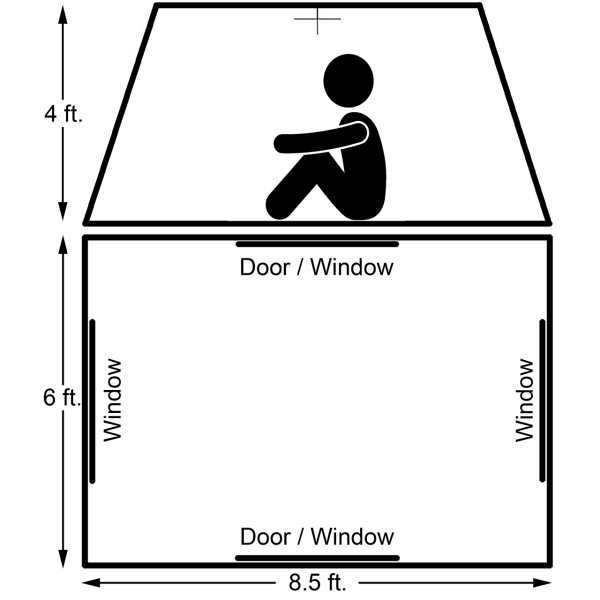 In the 9x8, your head would almost touch the ceiling. In the 10x10 and 10x14, you'd have plenty of headroom. 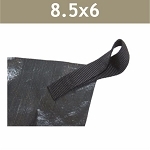 Q: Do you make ground tarp for 8.6 x 6 tent? 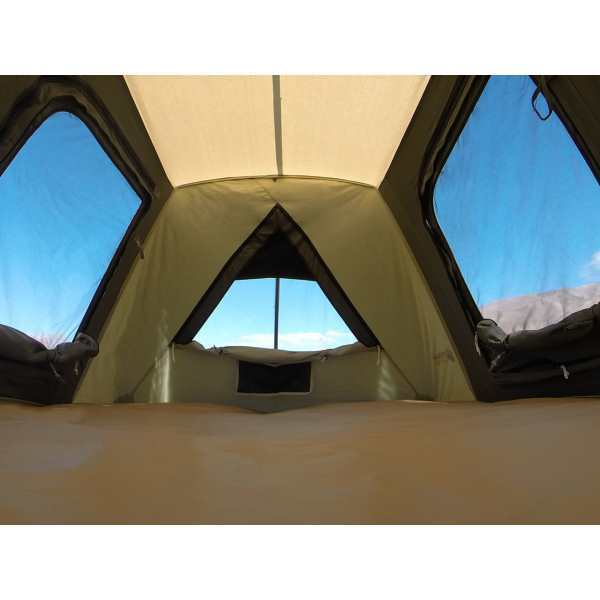 A: Unfortunately we don't currently have a tarp for this tent, the closest size would be the 9x8 tent 0598. I have sent an email to say there is interest in a tarp for this tent. Q: Are you able to completely close all of the windows/doors so that dust cannot enter during dust storm? Q: What is the standing height inside of tent? does this tent have a shade awning in front like the rest I've seen? Are there any other models with out shade awning? Thanks and God bless. A: It is 4' high. 6' wide x 8.5' long. 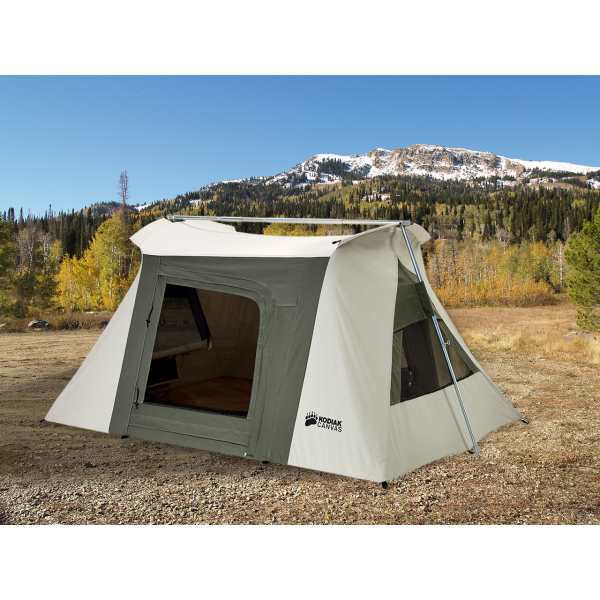 This is the Smallest Flex bow Kodiak tent that we have. The other Flex Bows will have much higher ceilings. The Awnings on all of the tents can be rolled up and stowed against the tent. Q: Hi, I'm try to purchase a two man tent that will be good for extreme cold weather. I went camping to the sequoia mountain last year in October and had a bad experience with my tent, super freezing. 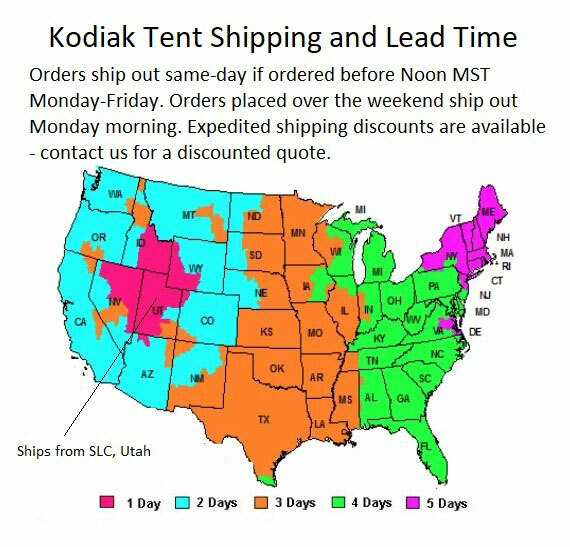 How is the Kodiak tent with extreme weather? 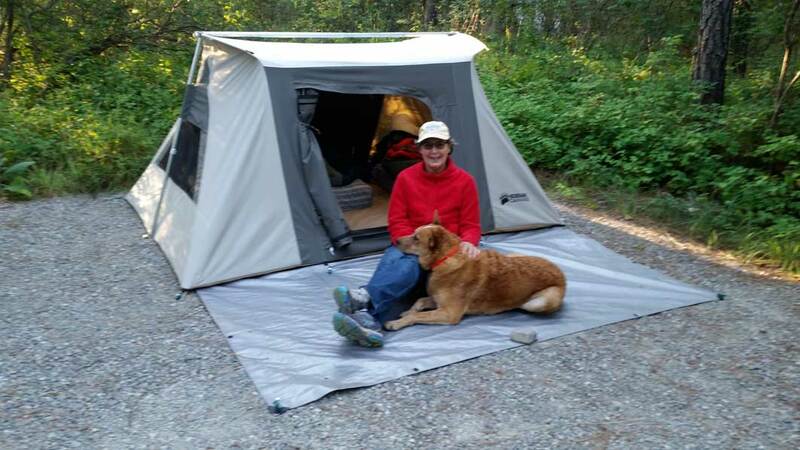 A: The Kodiak tents are the best tents that I know of for Extreme weather. The canvas is very good at trapping heat during the winter time. In the summer you can lower the temperature by rolling the windows down. Q: I was shopping this tent before lunch. I came back after lunch and it is $30 more. Will it be $269 again? A: Please call us at 866-308-5484 and we will get you taken care of. A: It doesn't really matter where you season it. It's not about idea to set it up before your camping trip to ensure that all the parts in the tent is in order. Q: I found the owners manual and think I answered my own question, you could do this at the campground? thanks. A: I'm not quite sure what you're referring to. I'm assuming you're asking if you can season it at the campground? I don't see why not. Q: Is the smallest Kodiak freestanding? one review says it is not though it appears so the pictures. This review is the only mention of this and this detail is crucial for my trip plans. The video is too general, just a promo for the whole line, so cannot tell. 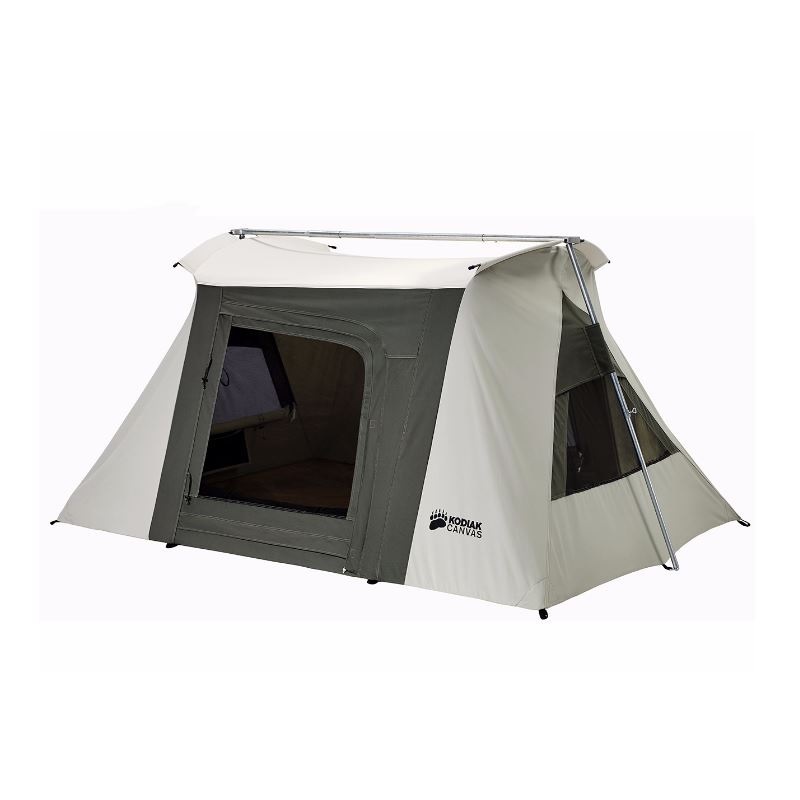 A: Yes, this is the smallest Kodiak freestanding tent. Feel free to contact us with any other questions. Was this answer helpful? 3 of 14 Customer(s) found this Answer helpful. Q: another review says "set it up on the lawn and hosed it down as we where supposed to do." Is this really necessary? city dweller here with no yard or hose. thanks. A: I know it goes against the common practice, but I have the 8.5 x 6 and a 10 x 10 Flexbow and neither one has been hosed down. I always put a tarp over my tents so downpours have never been a problem. The few times I've been out with wind blown rain, the sides still didn't leak. But I will say that not having a yard may present a problem if the tent gets wet while on a trip and it doesn't have a chance to dry. 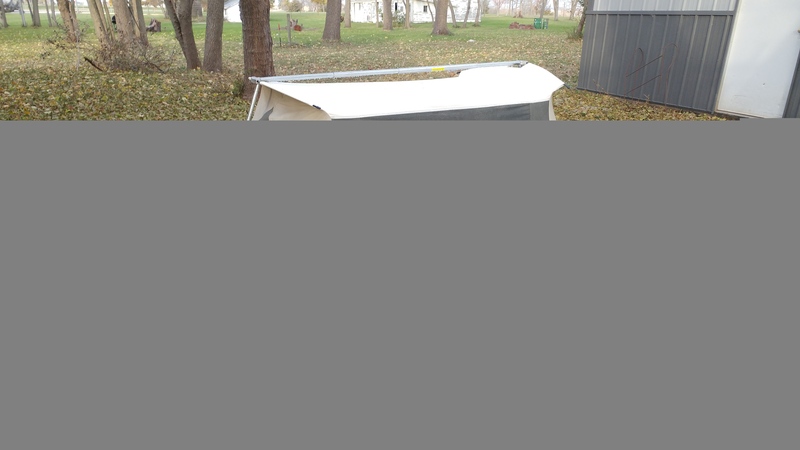 You definitely need a place to dry a canvas tent before storing it. A: Yes, it's important to do that to "season" the tent. Q: Does the listed 30 lb weight include the stakes? What is the breakdown in weight? A: The 30.5 lbs is the total weight. The tent weighs 15.5 lbs, poles 10.5 lbs, stakes 4.5 lbs. Q: Does the 2 person tent have the same weather protection as all the other flex bow tents? I want to make sure it can be sealed tight with no rain or dust able to penetrate. A: Yes, exact same waterproofing treatment. Q: When will you guys have this tent back in stock? 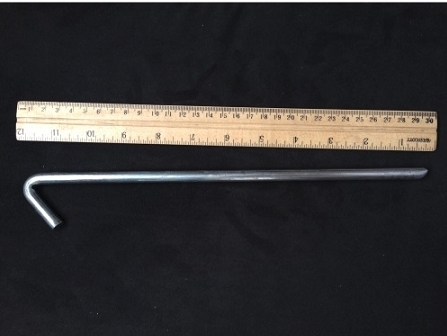 Q: Of the 30.5 lbs shown, how much do the stakes and poles weigh? A: It is very close to half. I would estimate 15 pounds. A: We have a shipment coming in on April 15, 2016. We expect to get more in at that time. Q: What is the interior height of this tent? Dimensions: 30" x 12" x 12"